Every show is different and can cater for your own specific needs and exact requirements. It is refreshing to know that you are dealing with a premier events entertainment company that has many years of experience; guaranteeing an event full of fun and laughter on a professional scale. Dave John B’s ‘It’s a Knockout’ provides unbeatable Roadshow entertainment in a safe and controlled environment. Incorporating unrivalled knockout entertainment with an original and extensive list of games and events, state of the art sound equipment, giant inflatables, water pools, mascots and related props, awards and trophies for winning teams, supplemented with individual certificates and medals for winning participants the “Dave John B It’s a Knockout” represents good, clean fun for all the family. An arena full of inflatables for the whole school to enjoy, teams normally take part in houses and battle it out with psychical activities, motivating pupils and working as a team to score points throughout the day. This is an all singing and dancing show and will keep pupils on their toes all day. Our original it’s a Knockout entertainment show. We have been providing schools with quality entertainment in a safe controlled arena for thirty-five years with no accidents or incidents. We are unique in our shows and performances. No other show in the world comes close to our presentation style. We are the first company to introduce this fast entertaining roadshow. The show can performed be indoor or outdoor. Testimonials are available on request. The hire fee covers the whole day. We supply inflatables, equipment, pools, staging & PA system. Our It's A Knockout event is high energy, colourful and supreme fun. We have a selection of large scale inflatable games and activities and we put these together with a giant scoreboard, sound system and genial host. The result is a spectacular event that often becomes an annual contest for those who take part. Teams will go head to head to battle it out on team activities. Teams are taken around the course in a round robin or a double round robin. A typical example for 24 teams would be 4 groups: A,B,C and D. Each group will contain 60 contestants which is split up into 6 teams of 10 . Everyone in the group will play against each other during the show. Each group will be allocated their own compare, complete with a radio microphone so we never miss a joker being played or an exciting moment. It is the same window frame if we are taking 60 or 480 contestants. If more teams are added we generate more groups with more compares. What is more important; no teams are waiting around to play any of the games. All of our Inflatables are inflated at the same time. We can facilitate this by using a 40kva diesel generator that is customized and permanently fitted into our lorry. They are not inflated one by one as contestants arrive at the games. Teams are welcome to wear fancy dress, with no sharp objects and it is advisable to remove any form of jewellery. Charity Fundraising. Over the last thirty-seven years, Dave John B's It's a Knockout Roadshow has helped raise hundreds of thousands of pounds for many charities. It is a great way to get together your corporate sponsors, have a ball and raise lots of cash! Apart from the obvious money raised from team sponsorship, many other opportunities to raise money exist and include game and T-shirt sponsorship and arena banner advertising. More teams means more money raised, and sponsorship is the key! Each team should aim to raise at least £500, that's 10 members in each team getting 25 sponsors at £2 each. Don't cap it there though! Encourage the teams to raise as much as possible, a prize could even be given to whichever team raises the most money. With all our units, we can cater for up to 100 teams a day, that's around 1200 contestants. A hugely impressive self contained game show derived from the hit television show It’s a Knockout from the 1970’s – A classic production re-presented with a modern twist using new technology, with an arena full of giant inflatables! Welcome to our company website, we are pleased you are taking the time to find out more about us and how we can advise and guide you in creating a stunning event. Whether you are team building, raising company morale, generating monies for charity, or simply rewarding your employees with an exciting, fun, participant event we will assist anyway possible. Over the last thirty-five years we have seen competition in this industry grow, but continued re-investment in sound equipment, machinery, costumes, inflatable’s and perhaps more importantly our skill set within company employees retains our position as market leaders in the field of It’s a Knockout light Entertainment. We remain one of the few full-time It’s A Knockout event providers and are very proud of our existing reputation and lasting commitment to quality in all areas of our events. Please take your time to navigate around the company website, watch a video demonstrating what your event could be like; or, even view our testimonials from many of our satisfied customers. You could be next on our Twitter or Facebook page to review comments, photographs and general feedback from your event. Case studies are also available for your viewing pleasure. An exceptional Disc Jockey and up to seven comperes provide a running commentary of hilarious events as they unfold on the field keeping participants and spectators entertained and engaged throughout. The only outfit to incorporate Themed Disco Roadshow entertainment, no other It’s a Knockout show in the world comes close to Dave John B’s presentation style. Our arena set up and presentation is unique as we prefer to get the audience as close to the games and staging area as possible. This adds more flavour and atmosphere to the show with everybody getting to join in the entertainment fully; ensuring no-one is left out. All crew members are fully trained in all aspects of the show and you can expect them to be polite, helpful and professional at all times. This guarantees the contestant’s safety and enjoyment of the day whilst ensuring that everyone feels fully involved. Simply put, Dave John B’s It’s a Knockout is tops for entertainment value. An arena full of bespoke giant Inflatables, complete with a disco cabaret roadshow, supported by a myriad of stage props and equipment guarantees a magical, wonderful day full of fun and laughter. In the pursuit of excellence and in the interests of continuous development, further investment in the company has seen the recent acquisition of a top of the range, purpose built lorry complete with sound show and internal stage aiding top quality presentation and sound to support the show. The recent acquisition of brand new Inflatables, costumes and outfits to ensure maximum visual effect further separates Dave John B’s It’s a Knockout from the competition. Dave John B’s It’s a Knockout – Simply The Best! ©Dave John B’s It’s a Knockout. All Rights Reserved. It's official, the stag weekend has gone crazy! No longer do you have to make do with an average affair down your local spit and sawdust pit, or be limited to a small selection of cities. The stag party horizons have broadened and you can pretty much party anywhere you like! We've made it our mission to bring you the finest entertainment on earth. You only get one stag weekend so why not pull out all the stops and make it an event of epic proportions? Grooms have never had it so good. 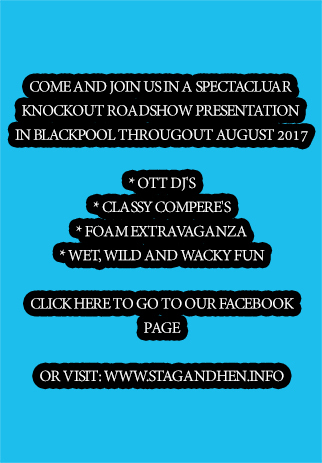 All across August 2019 we are taking bookings now for our Stag & Hen events based in Blackpool, Lancashire. A day you'll never forget with one of the best It's a Knockout's in existance. For further information please use the contact details on our contact page. If you are looking for a super fun activity which all of your group will love, then ‘It’s a Knockout’ will be absolutely perfect for all your stags or hens. As anyone who has ever seen the TV show will know, the It’s A Knockout activity involves all sorts of hilariously crazy games and challenges which are sure to have everyone having great fun! !